Gabe's babes: Happy Birthday Mr. S! 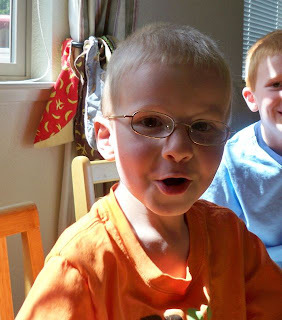 Mr. S just turned 5! He had a fun day and most of his birthday wishes came true. He had asked for a new "big boy" quilt since he was using a very sweet mother goose quilt that was great for a little boy, but he was getting a bit old for that. He also wanted a "tommy hawk" after watching a knife and tomahawk throwing DVD. Rob found a nice wooden one for him, it made him happy, but he is looking forward to when he is old enough to have a real one. The biggest hit was the trick flash light that daddy got for him. It gives you a good shock when you try to turn it on. He had a great time at church showing it to as many people as we would let him! He had a hard time choosing his cake this year as well as his foods. He just could not decide. 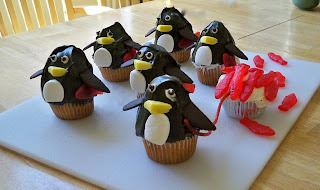 He finally chose the penguin cupcakes that I had made before. He had the bucket one with all of the candy fish on it, he didn't even make it to the cupcake, he was done after eating all of the fish (and licking off the frosting)!